I have always loved the look of dried flower arrangements. Last week it was my plan, to make a green and purple paper flower bouquet out of vintage styled printed paper. I went to several craft stores looking for some sheets that would match the image I had in my mind but alas none were to be found. So I went to Adobe Photoshop and designed papers and petals myself, and then printed out the flower parts on ordinary computer paper with a laser printer. I was looking for a dark antique style that would be reminiscent of aged dried flowers and think I ended with good results. These flowers are a snap to make once they are printed and cut. Make a couple of them and arrange in a vase with natural floral elements. Very pretty! Print out the small, medium and large flower petals. Print out the leaf page. Turn the flower petal sheets over, and print the Kraft paper file onto the backs of the flower petal sheets. Turn the leaf page over and print the dark green file onto the back of the page. You can either print the purple page out onto the white sheet of cardstock or use a page of deep purple commercial cardstock. Cut out the petals, sepal and leafs with scissors. Cut the purple dots on a digital die cutter using the downloaded cutting files or cut out with a 3/4/ inch round paper punch. Insert the wooden dowel into the styrofoam ball. Secure it with a bit of hot glue. Start glueing the purple dots onto the styrofoam ball top with hot glue. Make sure to attach the dots starting at the top and continuing downwards in a spiral. Cover the ball about 3/4 from the top downwards. The petals will cover the rest of the styrofoam ball after they are attached. Cut nine small flower petals. Cut nine medium sized flower petals. Cut nine large sized flower petals. Score a line down each flower petal on the purple side with a bone folder. Use a pencil to curl all petal edges giving each petal some depth and dimension. Glue the nine small petals with hot glue onto the top of the styrofoam ball as in the photo above. Glue the nine medium sized petals under the small petals as in the photo above. 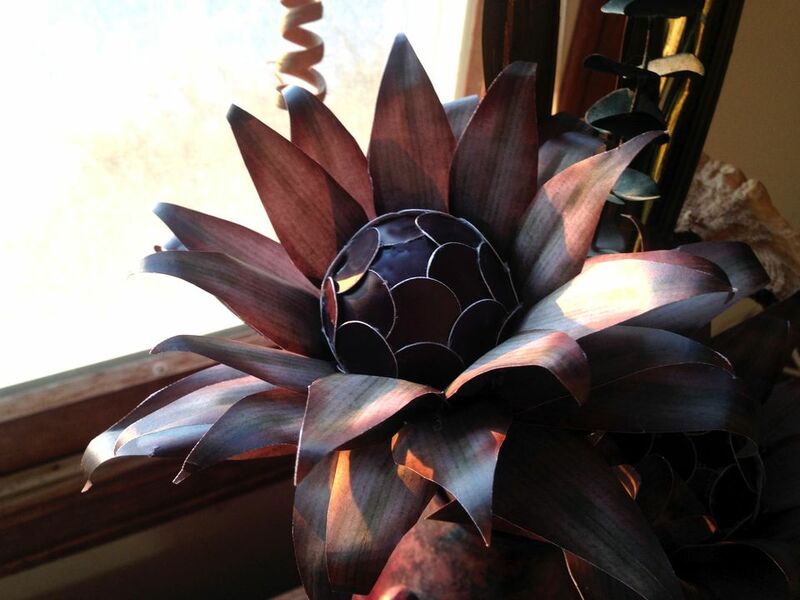 Glue the nine large petals onto the bottom of the styrofoam ball. Curl the edges of the sepal with the pencil, and cut a small hole in the middle. Insert the dowel into the hole and place the sepal next to the bottom of the styrofoam ball.Secure with a bit of hot glue. Cover the wooden dowel with brown floral tape. Fold the leafs in half after scoring with a bone folder. Attach the leafs to the stem with some hot glue.